Today is the birthday of Russian playwright and short story writer Anton Chekhov (1860-1904). Chekhov began writing as a way to support his family when he was a teenager, selling stories to newspapers. Although he is today recognized as one of the greatest fiction writers of all time, Chekhov’s first love was medicine. 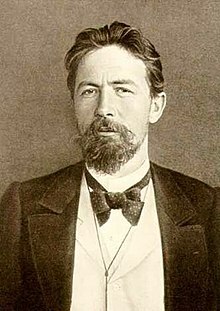 He described his relationship with medicine and writing with an apt metaphor: “Medicine is my lawful wife, and literature is my mistress.” Unfortunately Chekhov had barely started his career as a doctor when he contracted tuberculosis, which took his life when he was just 44 years old. Here we have an example of the kind of concrete language that creates a picture in the reader’s mind. Concrete language engages the reader’s senses, allowing the reader to see, hear, feel, smell, and/or taste vicariously. In descriptions of Nature one must seize on small details, grouping them so that when the reader closes his eyes he gets a picture. For instance, you’ll have a moonlit night if you write that on the mill dam a piece of glass from a broken bottle glittered like a bright little star, and that the black shadow of a dog or a wolf rolled past like a ball (1). Too often writers don’t follow Chekhov’s advice. It’s okay to talk about abstract ideas like love, war, freedom, or failure, but to truly show and to truly evoke images, the writer must use concrete language that engages the reader’s five senses. This is the type of language that creates a dominant impression the mind of the reader. For example, notice how the two passages below both go far beyond telling the reader that “war is an oppressive struggle”; instead, they both show the druggery of war in vivid detail. Often, they carried each other, the wounded or weak. They carried infections. They carried chess sets, basketballs, Vietnamese-English dictionaries, insignia of rank, Bronze Stars and Purple Hearts, plastic cards imprinted with the Code of Conduct. They carried diseases, among them malaria and dysentery. They carried lice and ringworm and leeches and paddy algae and various rots and molds. They carried the land itself—Vietnam, the place, the soil—a powdery orange-red dust that covered their boots and fatigues and faces. They carried the sky. How can you support a generalization with strong imagery and sensory details that create a showing picture for your reader? Support a telling generalization with specific showing details that make a dominant impression on the reader. Use sensory language that engage your reader’s senses, by including details that the reader can see, hear, feel, taste, and/or smell. Learning a new skill can be difficult. Persistence is an essential trait for successful people. Failure is often a springboard for success. Procrastination is a major problem for students. Summer is the best time of the year.